We are working with commercial bus operators and our contractors to keep buses running as smoothly as possible during the Bromley Heath Viaduct works. The more people who take the bus instead of getting in their car will reduce the number of vehicles held up in delays through the contraflow. Most bus operators now offer free WiFi on their services so passengers can make use of their journey time more efficiently. We are opening this new facility ahead of schedule in the week commencing 17 July to allow drivers to park on site and make their onward journey using public transport, car sharing or walking or cycling. There will be 102 spaces, 16 disabled bays, 24 cycle spaces and one motorcycle bay open for use initially with a further 144 spaces opening shortly. A number of bus services already serve the park and ride including the X48, 10, 462 and 86. Please visit www.travelwest.info for details. The park and ride is located off the A4174 off the Rosary roundabout on Willowherb Road. Directional signs are in place along the ring road. During the work programme, cyclists and pedestrians will be directed through the contraflow on the ring road. 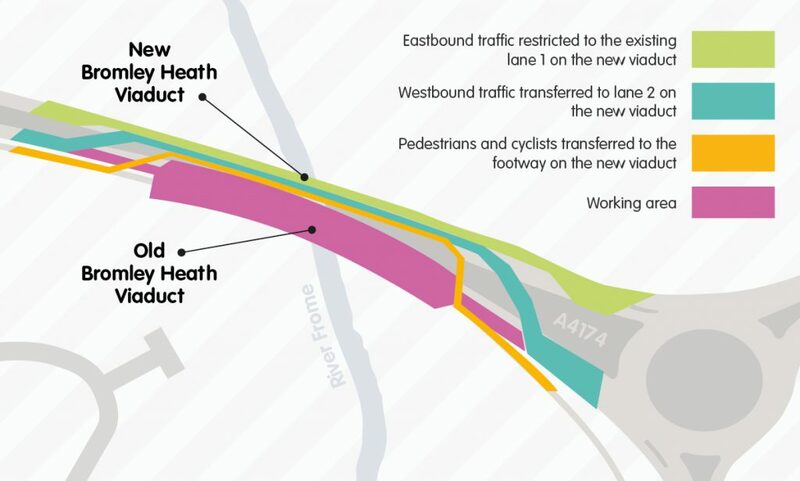 They will use an existing shared use footpath over the northern viaduct, which is the same width as the footpath on the southern viaduct. The contraflow for cyclists and pedestrians will begin after vehicular traffic has joined the contraflow and end before vehicular traffic rejoins the main carriageway. Please note cyclists will be asked to dismount over the viaduct. This will be for the shortest section possible, where the footway is at its narrowest, and will prevent risk of injury or accident. We are sorry for the inconvenience this may cause but dismounting will be safer for all road users. See the orange route on the below contraflow map. Where other routes are closed to traffic, access for cyclists and pedestrians will be maintained. The works are an opportunity for those living more locally to travel more actively whether it is by cycling to work or walking your children to school. The council is encouraging anyone who can travel on foot or by bike through the works to do so as regularly as possible. Just one or two days cycling or walking to work by bike will significantly reduce the amount of time you are sat in traffic per week. the council can provide free loan bikes for up to a month. Electric bikes, commuter bikes or fold-up bikes are available. Visit betterbybike.info for more information. Parkway Station will be closed for a period in September and we are liaising with the rail operator to plan for any additional pressure this closure may cause to the road network. Patchway and Filton Abbey Wood stations will be open joining during this time. Journey and car sharing portal www.joinmyjourney.co.uk is a free to use website for commuters to discover other commuters to share compatible journeys across the West of England.